The Country Wine Buffet has two doors, three drawers and a center opening with wine storage racks. The drawers are on wood runners for ease of opening. The doors have raised panels with flat insets and framed, mitered moldings. There are shelves behind each door they are centered in the opening. The wine rack can hold up to 12 bottles. Wine enthusiasts will love the Country Wine Buffet for storing and sharing "reds" and "whites." 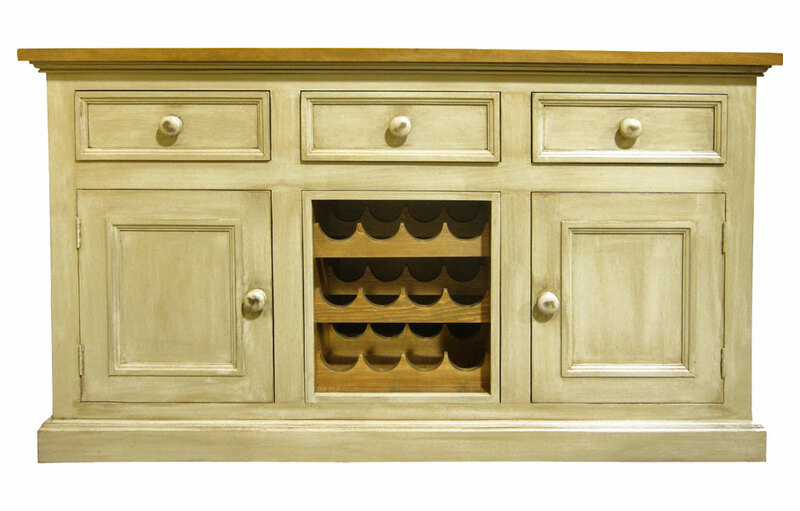 The solid wood wine console offers plenty of serving area, barware storage and wine rack in one elegant cabinet. 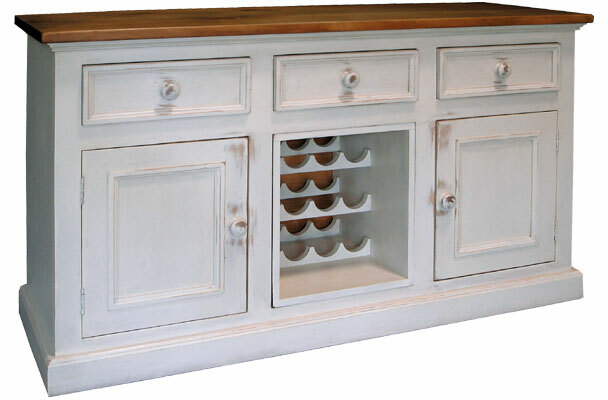 The Country Wine Buffet has two doors, three drawers and a center opening with wine storage rack like those found in Napa, Sonoma and Provence. The center open wine rack which has (3) rows with (4) bottle areas. The sides have closed cabinets doors with a removable center interior shelf for liquor bottles, or tablewares. The upper three drawers provide ample room for silverware, barware and towel storage. The top is water-sealed for everyday use—serving drinks and holding glassware. 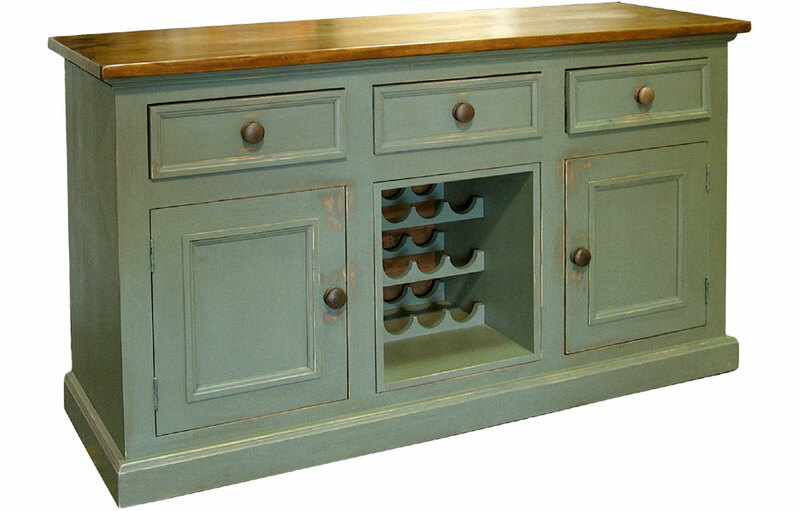 The rustic wine country cabinet details include; doors with raised panels and flat insets and framed, mitered moldings. The base has flat molding for a rustic wine cellar storage feel. 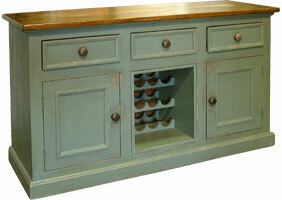 It's a multi-functional low cupboard for a dining room, kitchen nook or bar area. The low bar cabinet can be painted in a classic two-tone finish with a stained interior and top with painted exterior, or all-over one color finish. 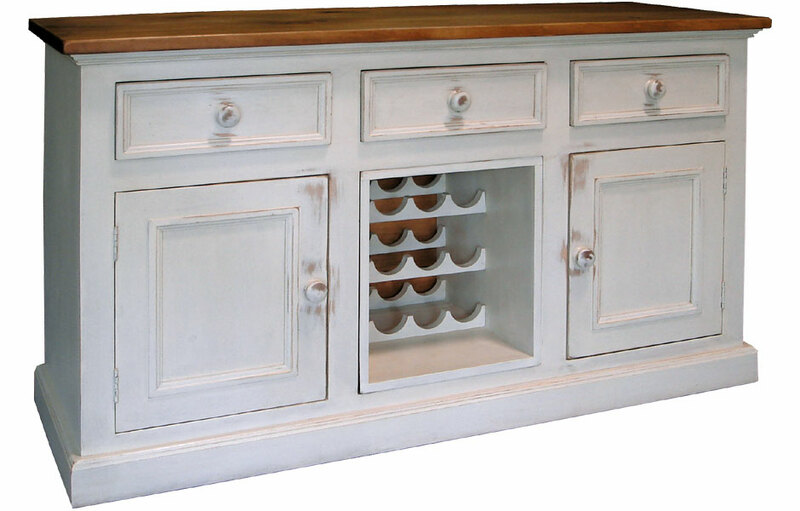 The Country French Wine Buffet complements French Country, English Cottage, Farmhouse, Rustic, Transitional and Traditional style decors. Country Wine Buffet finished in Sturbridge. 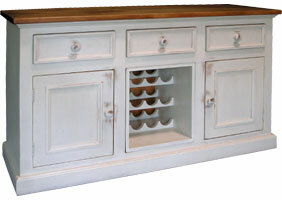 Country Wine Buffet finished in Acadia Pear.